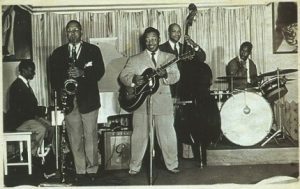 The dominant commercial style of black music in the years just before rock ‘n’ roll’s arrival was a hybrid sound, generally referred to as jump blues, though it was primarily derived from jazz with only elements of blues woven in. The songs were earthy and humorous which was a departure from the classy and sophisticated sounds that had been in vogue prior to that. The acts which specialized in this brand of music were smaller self-contained groups than what was generally found in swing, big band and jazz ensembles at the time and to compensate for the slimmed down membership they’d learned to pack more energy into their songs by emphasizing the distinct attributes of each individual instrument in the arrangements. Louis Jordan was the towering figure of that scene, so popular in fact that he regularly crossed into the white dominated pop charts, even topping the country & western listings at one point, and scoring a whopping 57 “race” hits in a ten year span, all but three of which hit the Top Ten, including 18 #1’s, a run of dominance that few in any style and any era could come close to matching. Naturally others taking a similar approach sprang up in his wake and scored huge hits of their own, among them Roy Milton & His Solid Senders, Lucky Millinder, Joe Liggins & His Honeydrippers, The Five Red Caps, Eddie “Cleanhead” Vinson and Bull Moose Jackson, each adding their own unique flavors to the formula, but essentially appealing to the same audience sensibilities. This landscape which ruled the mid-1940’s is where the seeds of rock ‘n’ roll were planted… but the artists who defined it weren’t rock themselves, nor would they ever be. These “transitional” figures paved the way for what followed yet because they’d already achieved considerable success in their own style, a style that seemed certain at the time to continue its commercial dominance even as rock dawned, there was simply no need for them to further modify their sound to appeal to a new audience coming along who possessed a different cultural and musical outlook. And so it was left to others to de-emphasize the jazzier inclinations of these predecessors, changing the style of the horns from swinging to honking, muscling up the backbeat, singing with more assertiveness and emotional abandonment while shifting the themes from more humorous novelties designed not to provoke white backlash that this earlier breed of musicians specialized in, to brazenly celebrating the realities of black life in all of its grit and glory that the more defiant rock generation embraced. But for those caught between the two divergent styles and eras the decision on which road to pursue would have its share of internal conflict. Gene Phillips had come from the same fertile musical ground that had sprouted many of these artists but he seemed destined to remain in the looming shadow of those who had beaten him to it and were already stars. While there was still a vibrant market for that style, by the time Gene got his shot at the brass ring it was the established acts who seemed to have a stranglehold on the rather limited outlets for broad exposure. Radio’s ostensible methods of segregation meant the airwaves would remain tough to crack for unknown black artists; jukeboxes – the primary form of reaching the black community at large – had but twenty available slots, half of which seemed to be permanently occupied by the prolific Jordan; and trying to spread your club appearances beyond a home territory was something that required some tangible hits and since there were only five records on the national race charts at the time – which encompassed ALL black music, from jazz and blues to gospel and pop – the odds were against that as well. It wasn’t that Phillips was without talent. A solid guitarist with lusty vocal power, he’d given it a good shot with the release of “Big Fat Mama”, a song done first by Millinder which had the right components to connect, but when sticking to a style already perfected by others it wasn’t enough to get him to stand out, not when the originators were still around making music in the same vein that was done a little bit better and with fresher material and who had bigger reputations with which to sell it. Yet contained within that record were hints that Phillips possessed something the big name artists did not, as his enthusiastic reading of the ribald lyrics pushed the envelope of what was acceptable more than those others had needed to. Now as the summer of 1947 was winding down there were signs that there might just be an opportunity to carve out his own niche in the music world by pursuing that approach further. But the decision to take more of a creative risk wasn’t always an easy one to make, as to do so required moving away from a style that was already well established in favor of something with no track record and thus no assurance there was even a large enough potential audience to aim for. The young artists just coming along behind them, like Roy Brown, had no such quandary to deal with. To these newcomers the possibilities stretched before them seemed limitless, simply because they hadn’t yet failed and thus probably didn’t consider failure to be a real possibility. But for the slightly older crowd, guys like Gene Phillips, having just turned 33 years old, failure – or at least a lack of discernible success – was what he was staring in the face each time he looked up as the direction he’d been pursuing seemed frustratingly closed off to him. If there was a crossroads in the career of Gene Phillips this was most decidedly it and so while his move towards rock in mid-1947 may not have been altogether a conscious one he set out in that direction all the same out of pure necessity. Right away Phillips makes his presence known, hitting the strings of his amped up guitar and following it with a decidedly un-refined shout, a bellow is more like it, announcing his arrival on the rock scene in no uncertain terms. Hey-hey, pretty mama!, delivered in a throaty voice with clear diction that’s answered with quick bursts from the horns before he continues by complimenting the gal in question on her great big pretty legs. It’s direct, it’s crude and it’s defiantly so. Rock ‘n’ roll’s DNA in a nutshell. Looking back at this with the hindsight of seven decades you can see where the schism in the music categories that gave rise to rock took place. Whatever Phillips was thinking this might be as he launched into this still nameless style he surely knew what it wasn’t. This certainly isn’t jazz, it’s far too uncivilized for that. It’s too restless for the blues as well, the horns alone drag it from the safe blues cocoon and the rolling piano that follows the intro carries it down the stream to parts unknown. He’s managed to streamline the full band sound from his earlier pre-rock sides and transform the music into a more urgent sound in the process. His vocals are enthusiastic and mildly suggestive but don’t venture into the territory that’d mark this as merely an off-color novelty record of the type Julia Lee was successfully cutting at the time. Left without a comfortable home in those dominant and well-established black musical categories this wanders the countryside looking for a place to call home and stumbles into the brand new rock territory, a barren land at the time, and liking the wide open vistas stretching out all around him he promptly puts up a ramshackle dwelling and moves in. Right away he adds some character to the burgeoning neighborhood if nothing else. Surprisingly for its content, the song’s primary appeal comes not from the lyrics as much as the arrangement, replete with horns answering his cries, the pianist’s left hand providing the bulk of the rhythmic thrust, and the whole kit-and-caboodle being pulled along by an infectious spirit that pervades the record’s opening minute. Enthusiastic freedom would be one way to describe rock music throughout its life and in that regard anyway this fits the bill to a T, even if its specific attributes haven’t yet been tailored properly for the new style making it a bit ill-fitting if you look too close. The music starts to let it down too after the promising start, as the trumpets – as was the case so often early in rock before the tenor sax forcibly took over the horn section – are too prominent and not quite rousing enough, especially considering the thematic concept which calls for a more raunchy cohort in Phillips’s crimes, leaving it up to the rest of the instruments to pick up the slack. But after the rousing piano driven opening, which is worth the price of admission by itself, they fall back into the mix and never assert themselves again. The saxophone does get a solo midway through, but it’s somewhat lethargic in nature, never cutting loose to ramp up the excitement, which means the record will stand or fall with Phillips and his commitment to the new sounds and attitudes that will mark this music as something different. He gives it his all but enthusiasm aside it’s by no means a great performance, and certainly not a great song. There’s a repetitiveness to its construct that suggests a lack of creativity, as if all involved felt the concept itself, the implied raciness of the situation, would provide enough thrust to carry it through to the end without needing the embellish it along the way with anything more substantial. Gene’s vitality also wanes somewhat as the tune settles in for the stretch run, just when he should be breaking free of the song’s constraints and letting himself get carried away he instead eases off a little and maybe even looks back wistfully over his shoulder at the more familiar figures and styles he’s leaving behind. He seems conflicted, not quite sure he made the right move and as a result Big Legs, more than most songs we’ll include here, straddles the line between the past and the future, standing unsteadily on the still shaky terrain of the present landscape just as the musical fault line beneath his feet was about to break wide open. He’s not quite sure which way to lean at this point and as the stylistic fissures become more apparent his indecision will result in him falling into the chasm below. While this is only tangentially being able to be called rock for as long as his footing holds, it nonetheless provides the perfect glimpse at the internal struggle for an artist’s creative soul at a specific and historic moment in time we’ll never get to see again. But those bouts of uncertainty along the route are not surprising in any uncharted voyage. Rumor has it that Ferdinand Magellan called home at the first pay phone he came to on his trip around the world, asking his folks to come and get him because he was homesick, while Christopher Columbus tried booking a flight back to Spain as soon as he landed in the “new world” but the airlines wouldn’t take his foreign issued credit card. Like them Phillips did at least set foot on this new land, if only briefly in his case, and was rewarded for his journey. Though this didn’t penetrate the rather skimpy Billboard race charts, the magazine which is seen as the most “official” record for determining hits, it did make the Cash Box Harlem Charts, giving it at least some claim to being the first rock record to score commercially. Regardless of how valid that achievement is, or even how legitimate this is as a full-fledged rocker, there definitely IS something going on here that can’t be passed off with an uninterested shrug, and while it may be doubtful that any of the musicians, or Phillips himself for that matter, knew just what it was as they got underway, they surely had to feel the fresh breeze blowing in their faces as they forged ahead and be perked up by it. Like so many others in their circumstances they’d been on the road to nowhere for too long, driving in circles, low on gas, while all of their hoped-for destinations were filled with No Vacancy signs. Sooner or later you either give up and head back home, settling for a job in the fields or the filling station, or you turn off the crowded thoroughfare and drive on blindly with stubborn determination. With this session they’d left the marked roads behind, the familiar sights and musical landmarks they’d known for so long were now becoming smaller and smaller in their rearview mirrors, while the horizon ahead of them was broad, sparse and seemed to stretch on for infinity. There was, of course, very little traffic yet heading in this direction alongside them and so, for the time being at least, the traveling was smooth and easy even if they had no idea where they were headed, or even how they’d know they’d arrived when they got there… wherever “there” was. 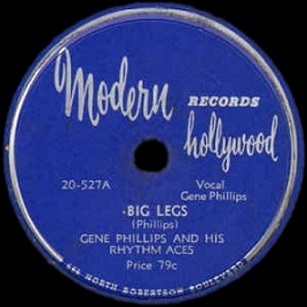 Leave a reply on "Gene Phillips & His Rhythm Aces: “Big Legs”"